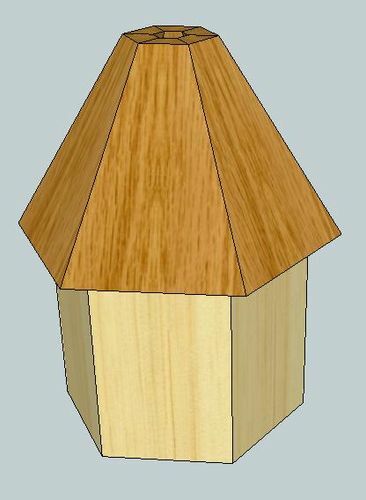 A fellow LJ member(Belg1960) was asking about designing an Octagon Birdhouse a while back. 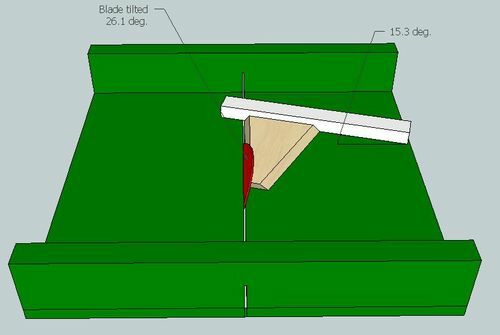 He recently contacted me and asked if I would show him how I would do it in SketchUp. I thought I would make this public for all to see. The method that Jim Jakosh provided was certainly a good one. 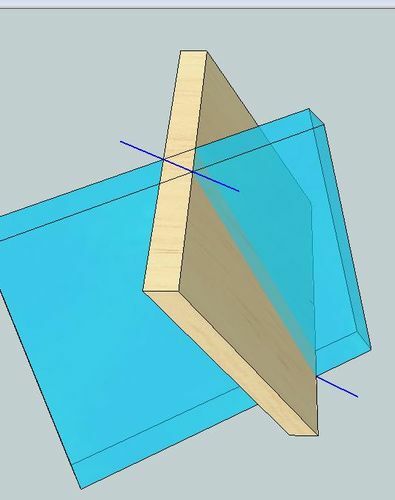 Every woodworker would benefit from understanding math as much as Jim does. Me, I tend to lean more on SU to do my math. The SU method I am presenting here is but one SU approach. There are other ways to do this in SU, but this is the first one and the easiest one that came to mind for me. 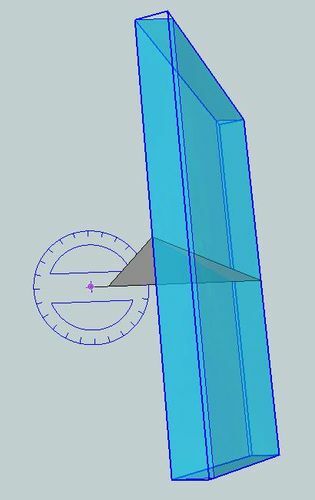 Let me say that my purpose with this scenario is to use SU to tell ME the dimensions and angles rather than me having to tell SU those values. This is most often the case with me when using SU during the design. Note the 1/2” line on the bottom left corner. 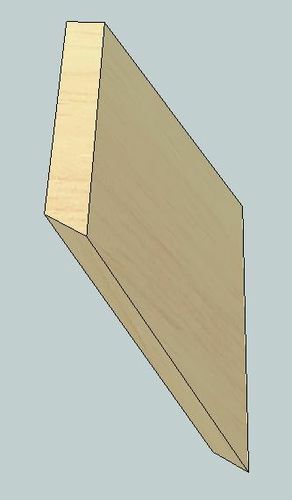 This represents the radius from the center point to the inner edge on the top where the finial will go. I also make all of this a ’Component’ so it doesn’t STICK to the other parts I’ll be drawing. SU tells ME that this is 28.4 degrees. 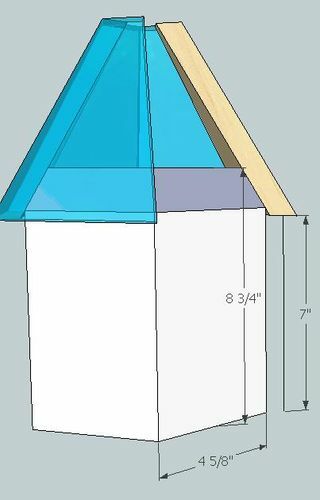 Incidently, this is the cut angle for the top & bottom of the roof panels. 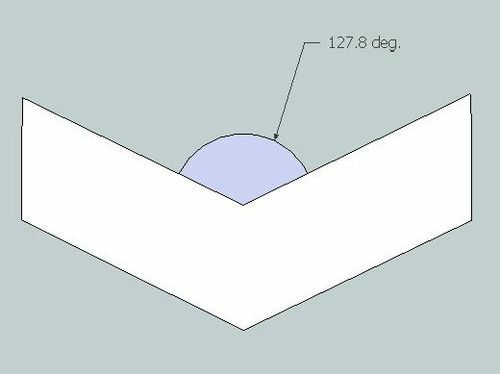 Note how it intersects with the triangle, thus keeping space for the hole in the center and not exceeding the roof diameter. 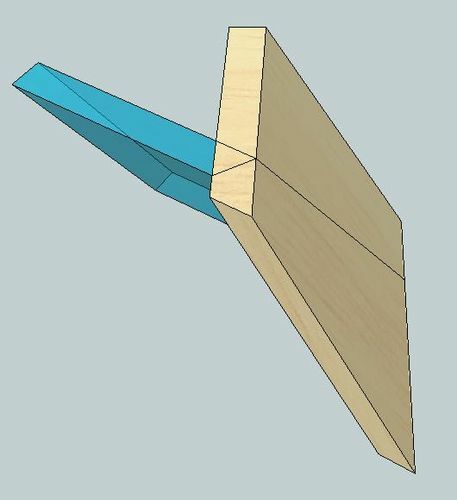 It is not just a parallel fit to the triangle. 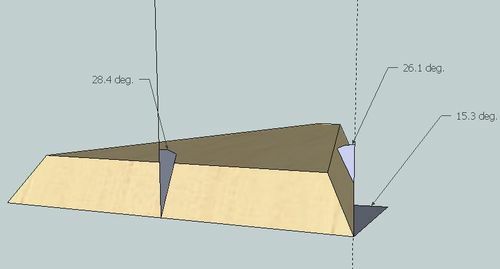 Now I convert this roof-panel profile into an actual 3D board by flattening the top & bottom, and pushing/pulling the front and rear faces to give it depth. The goal here is to extend it in both directions further than it needs to be. 5” ought to do it. These will be trimmed off in a later step. 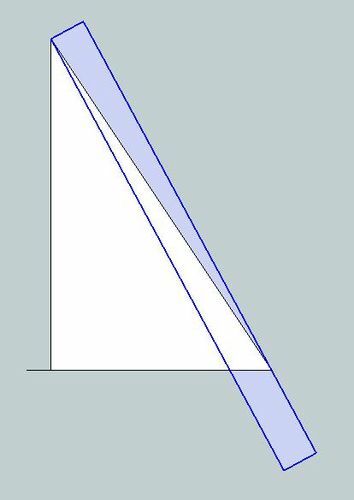 I’ve shown it transparent so you can see how it intersects the profile-triangle. The panel itself is also made into a ’Component’. Next, I rotate to an arial view to do the real magic. 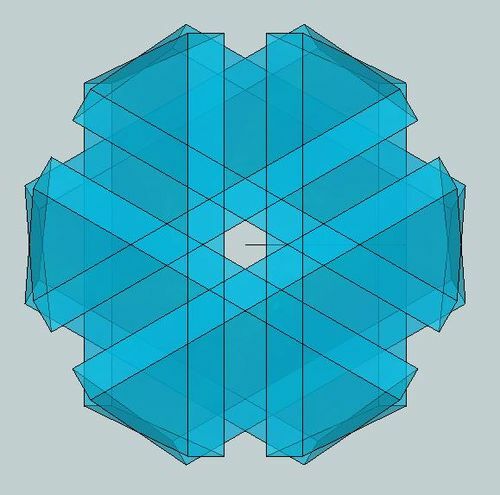 I will be copying(in a circular fashion) that panel 5 more times at 60 degrees(360/6 sides[a hexagon] = 60 degrees). Note the point of rotation around the tip of that line sticking out to the left of the profile-triangle. It actually looks to be a jumbled mess doesn’t it. By the way, since these panels are ’Components’, then any changes I do to one, gets replicated on ALL the other panels. Now comes the math part, but with no math at all. I draw an intersecting line where the two panels cross, from the inside intersection to the outer intersection. This is done on the top AND bottom beveled edges of the panel. Note that I also hid that one remaining blue panel to help eliminate some confusion to the non-SU users. But what am I looking at? Because these panels are ’Components’, any change I do to one, happens to them ALL. Even if I have them hidden. BTW, I do this using one of the most unused, but most useful features of SU, ’Paste In Place’. 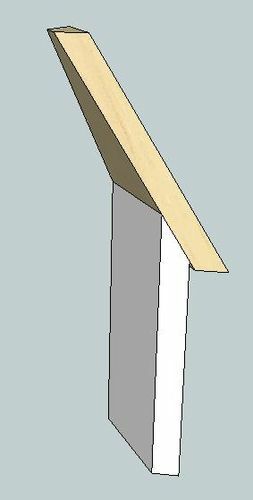 I drew a 7” vertical line from the base of the roof, downward. This gave me a general idea of how tall to make the actual sides. They need to stick down below the lower roof line 7”, but they are actually taller since they go up into the roof where they attach. Well that’s about it. Any comments, criticisms, and suggestions are welcome. 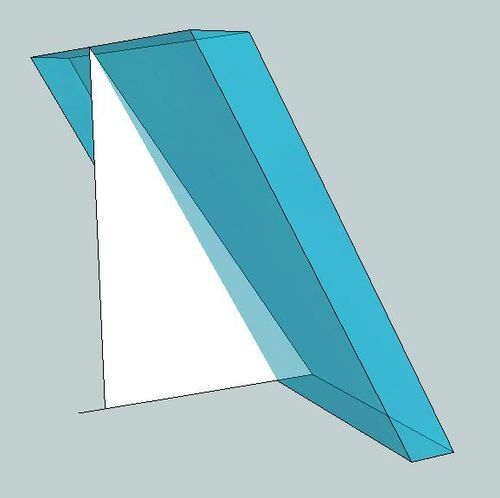 I hope this gives you some new ideas on how to use SU in your future projects. 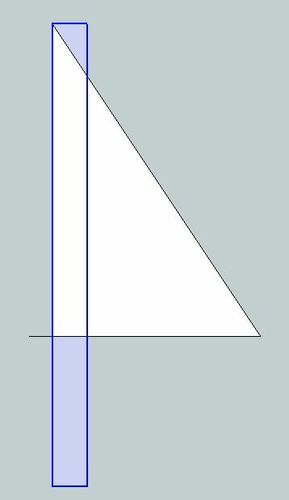 Oh, and that bevel angle for the tops of the side panels, well that would be 90-(the bottom angle of the roof panel: 28.4 deg. ), ie. 61.6 degrees, right? 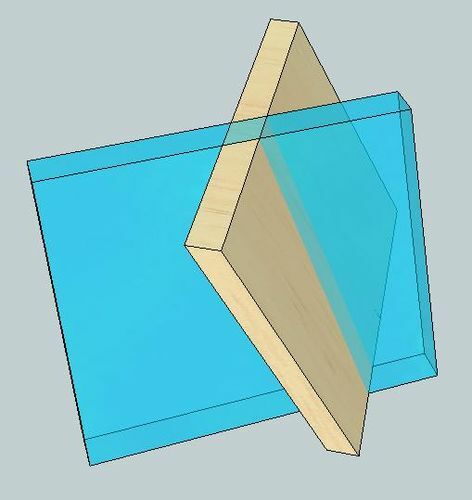 And the side bevels of any hexagonal box are 60 degrees. Really great tutorial. Thanks for posting. I will have to try this soon to see if I can duplicate your results. I just discovered your design series. Many thought provoking designs. Rance, the overall work looks absolutely fantastic. 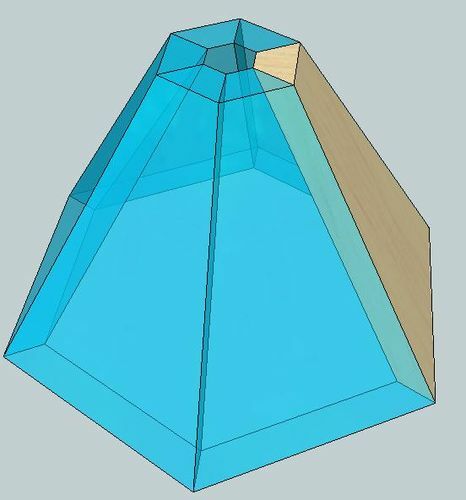 Now forgive the nieve’ question but could I change the dimensions to this in the future? The only other SU project I was involved with was in the SU library and this was made available to me so I could make the changes needed. 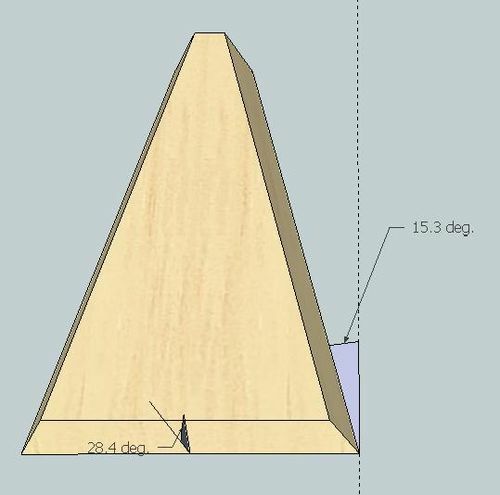 I have one question about the 8 5/64” dimension in the attached drawing, is that from long point to long point? 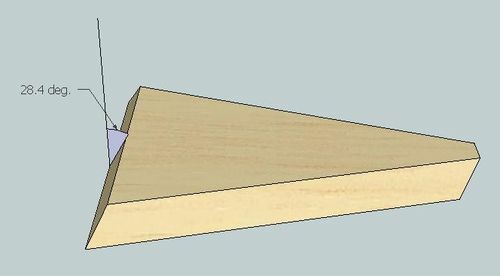 Would it be possible to add a jig to the blog to cut the angled pieces for the roof panels on the tablesaw? Thanks a lot Rance. Now I’ve got a major headache!!! I don’t think my brain is wired for this kind of stuff. 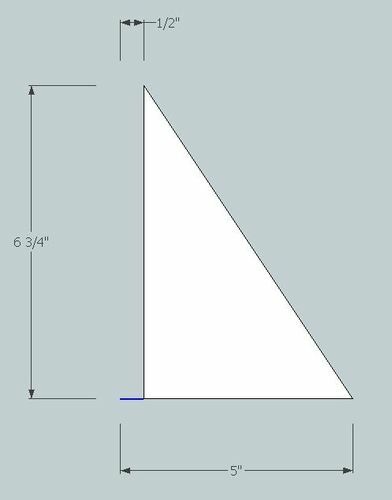 It took me a long time to figure out that I needed to cut 2 45s to make a mitered corner. 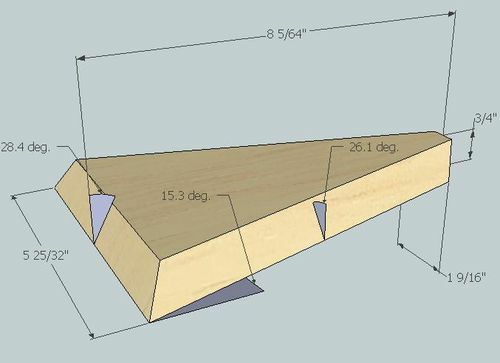 OK with you if I just saw my birdhouse from a log with the bandsaw and forego all the math? Thank you David. I really like to see how far I can take SU to keep me away from the math. It is a really neat tool. Andy, I think the birds would be perfectly happy with a log home. This is a view from behind the saw, facing the operator. 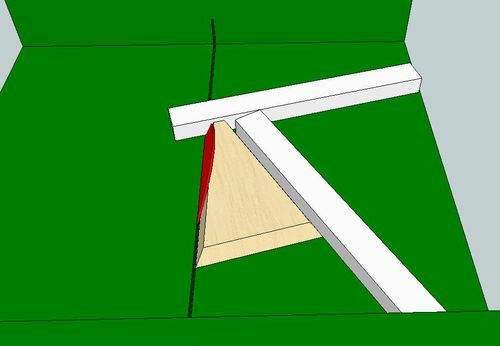 Screw the white block down to your TS sled at a 15.3 degree angle. 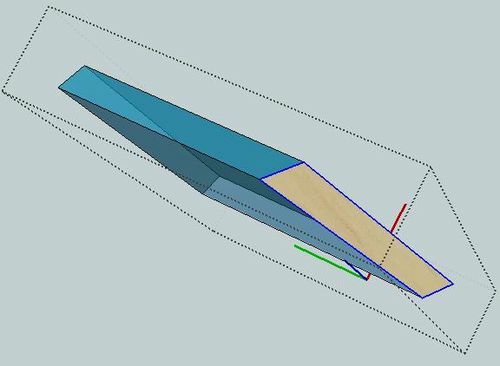 Then tilt your TS blade 26.1 degrees. 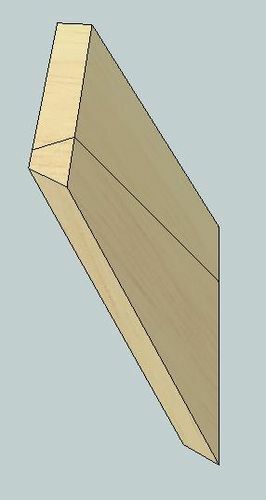 I bow to your mastery of geometry and I am even happier now to have the Woodturner Pro program which does most of this for me. 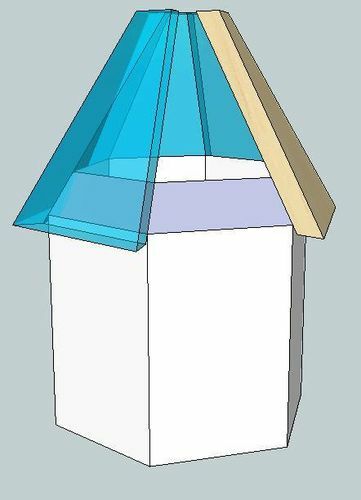 No matter, Your birdhouse design is very good. Solid and attractive too. Well done. I’m sure many will want to build it. Thanks for posting. This is good work , I think you are Engineer and you have many Skell s .
how did you get the 127.8 degree measurement?